Our Greensboro Contact Lens Center carries disposable multifocal lenses like Bausch & Lomb's Ultra for Presbyopia. Schedule a multifocal contact lens fitting. 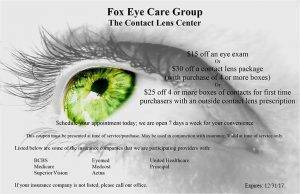 Our Greensboro Contact Lens Center carries disposable contact lenses for Dry Eye patients. Try out Dailies AquaComfort Plus with MoistureSeal technology.